Tangled and True: pinching my pennies. no, that's not a mistake, i didn't get it mixed up. i really & truly bought an ENTIRE cart full of groceries (including 3 gallons of milk, apple juice, cereal, tri-tip) for a grand total of $64.85. and yes, with $80.93 is savings, i actually saved more than i spent. That's great! Another one that is also very good is pinchingyourpennies.com and it's free! 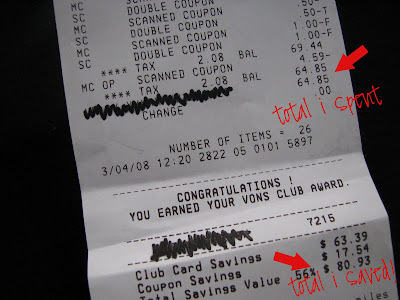 I have saved $200 on a shopping trip a few times! It's addicting and the "high" you get is so fun! i am just doing my 4 week trial for a $1 right now, and i am excited to see how it goes. especially since i am moving to manhattan, and we are really going to need to pinch those pennies! I wanted to do this a while back but then changed my mind and completely forgot about it. Think I will look into and do it this time. Thanks for the reminder! 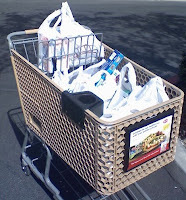 I love The Grocery Game and Pinchingyourpennies.com...great sites to save lots of money! Wow, congratulations. Tanks for passing the link on to us as well.